So maybe I'm missing out, maybe I'm not. 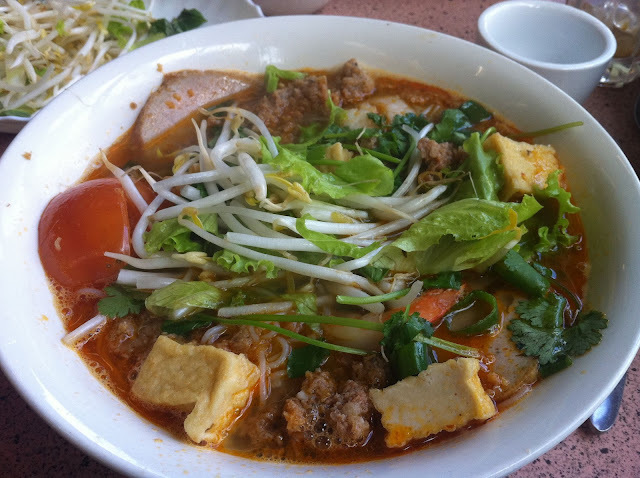 I don't feel too bad about it because whenever the weather gets a bit colder, Tina and I almost without a word spoken decide to head to Dinh Son Quan for a bowl of Bun Rieu or Bun Bo Hue. 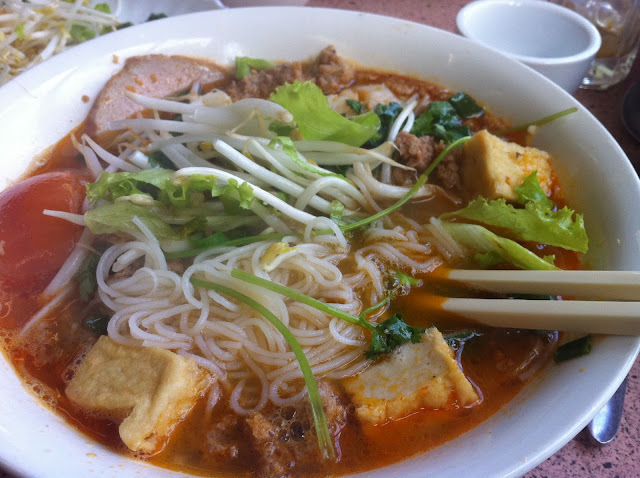 Bun Bo Hue is totally delicious but that's for another time, today is about Bun Rieu! 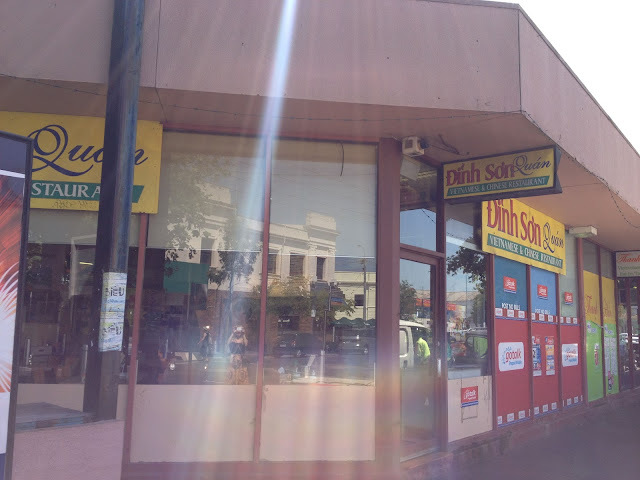 Dinh Son Quan have a number of specialties, including the Banh Cuon and Banh Cong dish that Lauren from Footscray Food Blog recently posted about. I also check the bain marie every visit searching (in vain) for the pork stuffed calamari dish that I had there ages ago and am desperately hoping will one day return. My personal discovery of Bun Rieu came from the Dinh Son Quan corkboard that contains a number of dishes listed in Vietnamese that when I first saw it were all a complete mystery to me. I don't have a photo of the mystery board but you can see it in this old post of Lauren's from 2010. It's a bit of a golden rule of mine that if a restaurant had a board with a list of dishes that's separate to the main menu these are the ones to try. Invariably they are the house specialties and more often than not they are the dishes that you're less likely to find anywhere else. The first time I noticed the corkboard I was not an iPhone owner so settled for scribbling down as many of the dishes as possible and returned home to research which ones to try on my next visit. After a quick google I had Bun Rieu at the top of my list. Bun Rieu is basically a tomato flavoured chicken or pork broth with my favourite thin rice noodles (thicker than vermicelli), fried tofu, Vietnamese pork loaf (Cha Lua) and the best bit, the crab and pork meatballs. When you eat Bun Rieu you notice that the meatballs aren't particularly well formed but seem to be these random clumps of pork and crab mix that taste awesome and have a particularly delicate texture, far more delicate than you could achieve by forming them with your hands and adding them to the soup. One of the things that makes Bun Rieu so interesting is that cooking it is like a gastronomic science experiment. What I mean is that the pork and crab mince is mixed with a few beaten eggs and forms a very watery, almost sauce like liquid which is certainly nothing like the meatball texture of the finished dish. When the soup has achieved the right balance from the stock, the crab, pork and egg liquid is poured into the soup over a gentle heat where it then magically melds into beautiful tender random clumps. It's actually quite an interesting process and not like anything I've seen before in Western cooking. If you want to have a go at cooking it yourself at home, a few recipe suggestions are gastronomy, Miss Adventure at Home and of course YouTube has a number of videos worth checking out. Check out Miss Adventure's Vietnamese recipe section while you're there, many of my favourite recipes have come from her blog. Now if you can't be bothered cooking Bun Rieu yourself then head to Dinh Son Quan, preferably on a colder day. Otherwise, if you're in the city Vietnamese Noodle House does a pretty decent version too. I find the Bun Rieu broth more flavoursome and much richer than Pho and as with most Vietnamese noodle soups adding of lots of sliced chillies only adds to the enjoyment. The crab and pork clumps are like delicious little hidden treasures that I find myself digging around searching for. And personally, I prefer the thin rice noodles over the more cumbersome wide noodles that are used in Pho but that's just me!